All right, but what’s the colour of red bugs’ blood? The Bugs family (extended). Drops and droplets of red bugs, running around and doing God knows what. Sur un chemin de cannes, mai 2009. — Cliquable. These look a lot like our box elder bugs. Yes, they look very similar indeed, except that the ones above are a bit reder in the face and elsewhere. Do you have any idea why they gather like that? 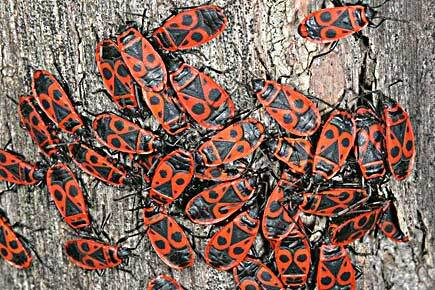 The American box elder bugs like to eat the seeds on box elder trees. They like sunny places. They usually stay close to the trees where they have their food. I have never seen the babies, only the large ones. Nijma: They usually stay close to the trees where they have their food. But there was no food there. They were all on a bare mineral surface, clinging to each other with no apparent reason. 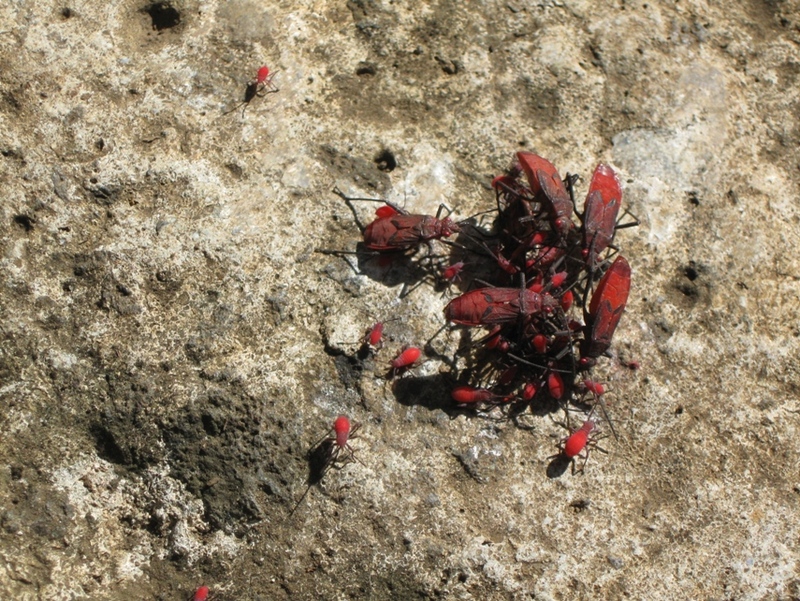 Vos red bugs me font penser à nos « gendarmes ». Ils se déplacent toujours (?) par deux, l’un sur l’autre ! Beaver, les “bugs” qu’on peut voir sur cette page ressemblent furieusement aux insectes photographiés à Vieux Grand Port. Mais si j’en crois l’article que lui consacre Wikipédia, Jadera haematoloma ne se rencontre que sur le continent américain. Des cousins peut-être ? A moins que ceux-ci aient débarqué sur Mars incognito, ces visiteurs-là se livrant à une activité occulte avant de prendre le pouvoir (ou de nous manger tous, jusqu’au dernier).